The Faculty has a strong focus on the training of health and education professionals and we're growing our life sciences portfolio. We have a proven record for graduate recruitment and our graduates are very successful in finding employment, with many taking jobs in the West Midlands. 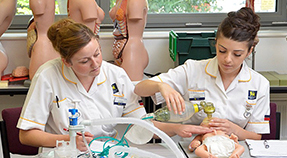 Courses are taught by a range of experienced practitioners, many of whom still have links in the education and healthcare sectors. We are the West Midlands regional provider for the pioneering education charity, Teach First and we work with Teaching Schools and School Alliances in the delivery of the School Direct programme. This is the third phase of the University's project to move all teaching and learning to two campuses, City Centre and City South. By moving our Education provision, we are creating a hub for the provision of public service contracts and professional development at City South Campus and improving the student experience with a stronger sense of community and more consistent support services and facilities. In addition to classrooms, a lecture theatre, social learning spaces, an open access IT suite and cafe facilities, the new £41 million extension to our City South Campus offers a range of specialist teaching and learning facilities for specific subjects including science, design and technology, drama and physical education. Follow the Faculty of Health, Education and Life Sciences on Facebook and Twitter to keep up-to-date on developments.